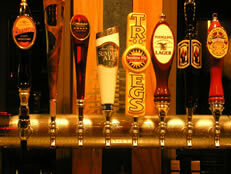 We offer beer line cleaning service to home bars, kegalators, restaurants, bars, pubs, cafe's, and firehouses. If you have one beer tap or thirty, we are ready to serve you. We provide top notch bar cleaning and beer lines services. Preserve your beer lines with our beer line cleaning service. Note: Due to the different procedures of each establishment, we do not change empty kegs. Note: Occasionally beer lines are extremely dirty. It may take numerous cleanings to eliminate the build up in the lines. There are situations when it is impossible to eliminate all the build up. Cleaning is still essential for good tasting beer. We will advise you if this problem persists and make cost effective recommendations. Don’t overlook cleaning your lines. Clean lines amounts to great tasting beer. Great tasting beer amounts to a satisfied customer. Allow us to keep you and your valued customers satisfied. Customers do notice the difference! All Systems Go is here to serve you! If you are not satisfied with your present service, or no one is servicing you, please take a moment and give us a call. We are here to serve you.